For close to a decade, the International Livestock Research Institute (ILRI) and its partners in the public, private and non-profit sectors have been engaged in designing and implementing index-based livestock insurance (IBLI) to protect livestock keepers from drought related asset losses. Introduced in Ethiopia in 2012, the conversation on IBLI is gaining momentum with more stakeholders investing in efforts towards its delivery, as well as the provision of other related agricultural index insurance products. 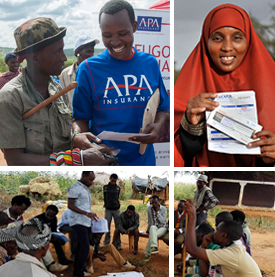 The value of IBLI has been demonstrated, for instance, by record payouts to insured pastoralists in Borana during the 2017 droughts and by the increased coverage of projects around crop-based index insurance. Based on this, the time was deemed ripe to convene a structured, purposeful conversation around catalysing a sustainable scale of IBLI and agricultural index insurance in Ethiopia. 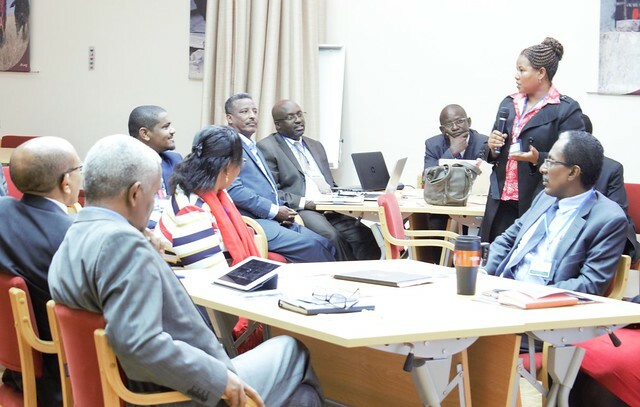 On 10 July 2018, ILRI’s IBLI team with support from the Technical Centre for Agricultural and Rural Cooperation ACP-EU (CTA) delivered a policy workshop, at the ILRI campus in Addis Ababa, that brought together key government policy and decision makers, researchers, private sector and development partners’ representatives to share experiences on agricultural insurance. More specifically, the purpose of this policy dialogue was to outline a concrete process towards the effective widespread provision of index-based livestock insurance, and more broadly agriculture insurance in Ethiopia. Participants of the policy dialogue workshop on scaling IBLI in Ethiopia (photo credit: ILRI/Bethlehem Alemu). Prof. Fekadu Gebre, state minister, Ministry of Agriculture and Livestock Development in Ethiopia was present at the meeting. His presence at the policy dialogue spoke not only to the criticality of the discussion on livestock insurance, but also to the commitment of the Ethiopian government to identify effective strategies for helping livestock herders and farmers manage the risks of drought. 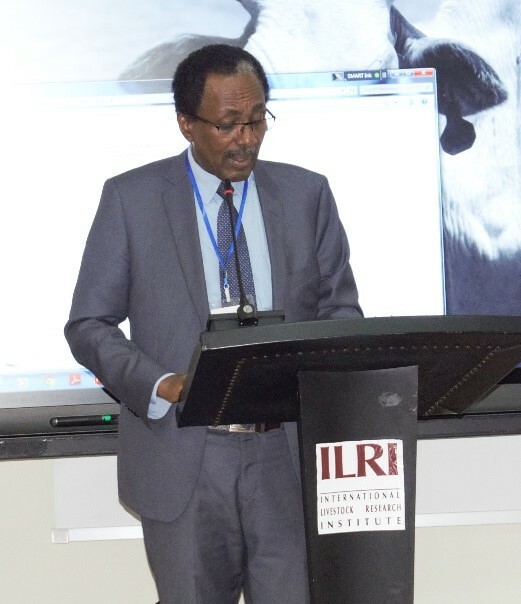 In his address to the participants, he highlighted the government’s recognition that IBLI is targeting one of the critical limiting factors faced by pastoralists—drought-related livestock mortality. He also noted that insurance can allow government to proactively and more cost-efficiently respond to severe drought risks and stated that the conversation on micro insurance in Ethiopia is timely. Various in-depth presentations from ILRI researchers, CTA, government and the private sector highlighted the extent of drought-related losses and the impact of such losses on pastoralists and their governments. Presentations and discussions also affirmed agricultural insurance and specifically livestock insurance, as an effective and cost-efficient tool for enhancing pastoralists’ resilience to drought. Participants delved into the specific experiences of the Index-based Livestock Insurance Program and strategic lessons related to supporting its sustainable scale. Experiences from the Kenya Livestock Insurance Program were presented as was the IBLI program in Ethiopia. As the policy dialogue was also aimed at capturing perspectives and identifying synergies for scale from a range of crop insurance pilots, representatives from the Oromia Insurance Company, Nyala Insurance, the Agricultural Transformation Agency and the United Nations World Food Programme also presented their lessons and experiences on weather index and micro insurance focusing on motivation, progress, trends and challenges of index-insurance in Ethiopia. Participants (left) and Prof. Fekadu Gebre, state minister, Ministry of Agriculture and Livestock Development in Ethiopia (right), at the policy dialogue workshop (photos credit: ILRI/Sarah Kasyoka). An expertly facilitated conversation ensured that participants engaged in productive and insightful conversations, uncovering critical issues for consideration around the value and challenges of scaling index-insurance in Ethiopia. Insights from the sessions emphasized the critical role of an enabling policy and regulatory environment in facilitating uptake of index insurance in Ethiopia. There was also agreement across the board that insurance needs to be bundled with other services such as micro-credit to increase uptake. The place of information and communication technology was also recognized as key in making insurance services available for smallholder producers and pastoralists. Leveraging technology was highlighted as a critical factor in minimizing the cost of delivering insurance products through; efficient beneficiary registration, digital sales services, insurance payouts (mobile money transfers), and information dissemination. Panel discussions allowed participants to delve deeper into issues pertinent to the scaling up of index-based livestock insurance in Ethiopia and establishing a concrete way forward. Key recommendations to this effect were articulated, among them being the need to establish a process under an empowered authority to define specific needs, outline actions and coordinate efforts to establish a sustainable agricultural index insurance program in Ethiopia. The national government (Ministry of Agriculture and Livestock Development) was unanimously identified as best-placed to host such a process and offer leadership for the development and scaling up of crop and livestock insurance programs in the country. There was also firm commitment expressed by all partners including the government, CTA, ILRI, and private insurance companies to deploy efforts and resources to move the process of scaling up index insurance in Ethiopia forward. It is envisioned that all stakeholders will now engage in concrete action to begin to implement the key recommendations reached, to continue to achieve impact for smallholder farmers and herders. The workshop was sponsored by CTA through its Climate and Markets East Africa (C-LI-MARK) Program as part of CTA’s broader support to the sustainable scale of index-based livestock insurance initiatives in partnership with ILRI, the Oromia Insurance Company and Takaful Insurance of Africa. Tags: CTA, KLIP, OIC. Bookmark the permalink.